The Project Pad • View topic - jbrentd's 2nd Chance CQ - She Runs! jbrentd's 2nd Chance CQ - She Runs! PRY4SNO wrote: This project is just motoring along nicely! Enjoying the updates, look forward to more. Well, the start attempt is on hold. Looks like the starter decided to stop working while it’s been sitting in a tub the past few month. Weird. I did find some issues with the ground strap connection and cleaned it up. Followed the checks from my Bentley. If you’ve got any other suggestions, I’m all ears. Try switching the little wire to the other post. I did the same thing when I first hooked mine up. Switched the wire, and fired up easily. DE80q wrote: Try switching the little wire to the other post. I did the same thing when I first hooked mine up. Switched the wire, and fired up easily. Thanks Dave, that did the trick. Now that it’s turning over and building oil pressure, need to see why it’s not firing. I know the cam and flywheel are in time, but not 100% on the dizzy. I didn’t touch the dizzy from the donor. You’re super close . I’d find out if it’s missing spark or fuel or both . FP relay is in ? Can you hear the fuel pump prime ? Both fuel pump fuses good ? 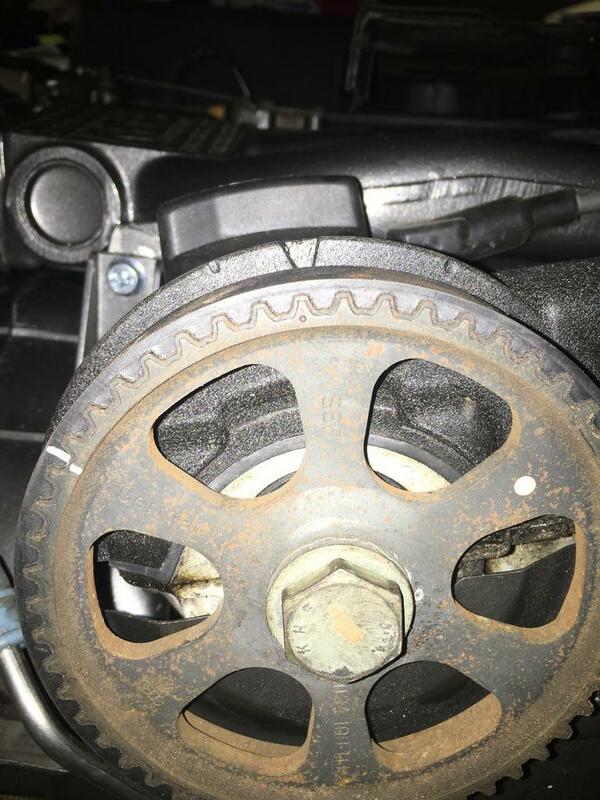 Hall sensor and crank position sensor plugged in? Ignition grounds at the head good? Afterthought wrote: You’re super close . I’d find out if it’s missing spark or fuel or both . I was hoping to get out in the garage today, but it’s too damn cold. I can hear the fuel pump and know there’s fuel at the rail because I had to swap a fuel line that was leaky. Sensors are all plugged in. I probably do need to check some grounds since I painted quite a few things. The ignition grounds...are you talking about the two posts on the back of the intake manifold? Yeah I might be getting confused with AAN but aren’t there a few grounds on the back of the intake manifold or the 7A? I think like you said lining up the distributor with all the marks at TDC is a great place to start. I had to get mine pretty exact to get it going . Those grounds and the timing and speed sensors are all good. I was able to confirm the marks on the distributor. Still no start. I also tried rotating the distributor back and forth slowly by hand while my son was trying to start the car. Nope. So, I started going through some of the regular checks. Coil, ignition timing sensor and engine speed sensor all passed ohm tests. Verified I’m getting 12v to the coil. I unplugged the coil wire from the distributor cap to see if I was getting spark. Nothing. Would that point to a bad coil/POS? Couple more things that have been checked. Found the ignition reference sensor and engine speed sensor were plugged in incorrectly. Swapped them. Still no start. Also verified continuity between ECU plugs and the coolant temperature sensor, ignition reference sensor, and engine speed sensor. Also confirmed 12v and grounds at the ECU plugs per Bentley. I’d like to check the signals from the ignition reference sensor and engine speed sensors, but I’m sure I’d need an oscilloscope...which I don’t have. I have a spare coil and ECU on the way. It kind of feels like randomly throwing parts at the problem. I always thought something was wrong with the ECU back when I owned this car the first time. Make sure the ECU is plugged in good too and the female side of the pins are in good shape . That’s not really what I suspect to look at first but while you’re in there . Also I think you checked this before but fuses are good right ? So if I remember right the car ran (but not well) with this wiring harness and ECU before ? Just the engine was changed but sensors and all that stayed.? You posted the timing marks . I doubt the machine shop would ever mess anything up but do yourself a favor if the engine is still at TDC, remove the oil filler cap and look at the two dots on the cams . Your timing mark on the cam gear tells you that one cam is in place but there is a chain holding them together . Also , I changed my plugs in my CQ today and I forgot to Gap them and could barely get the car to start so I gapped them and if fires . Now that you have fixed the two sensors do you still have no spark at all? Afterthought wrote: Make sure the ECU is plugged in good too and the female side of the pins are in good shape . That’s not really what I suspect to look at first but while you’re in there . All fuses are good except it looks like the PO put jumpers in lace of the low and high speed fan fuses. When I picked up the car, it started and ran, albeit really rough. Yes, just the engine changed. I swapped all of my sensors and accessories over, except the coolant temperature sensor. I did verify the cams when I had the valve cover off. The plugs are 3-pronged. Not sure how to gap them. I do need to check for spark after swapping those sensors. Last weekend, I tested the hall sensor and it failed the light test from the workshop manual. So, I swapped my spare distributor over from my old engine. The car was actually trying to start, but struggling. Best I can describe it as kind of chugging or bucking. At least there’s some progress! Today, I swapped in some different plug wires and removed the old cat since I suspect it might be clogged. When I went to start it, it turned over a few times, made some grinding sounds and then stopped. 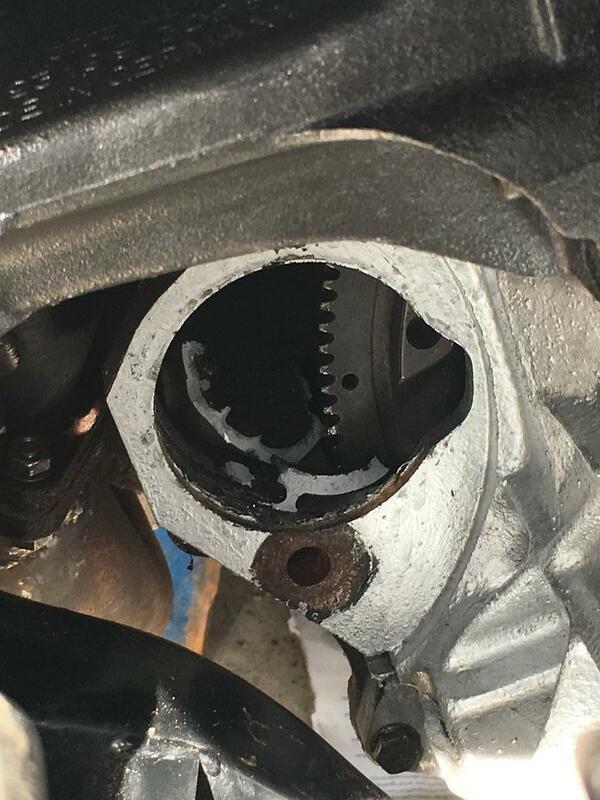 I turned the crank by hand and could hear some awful grinding sounds from the starter area. 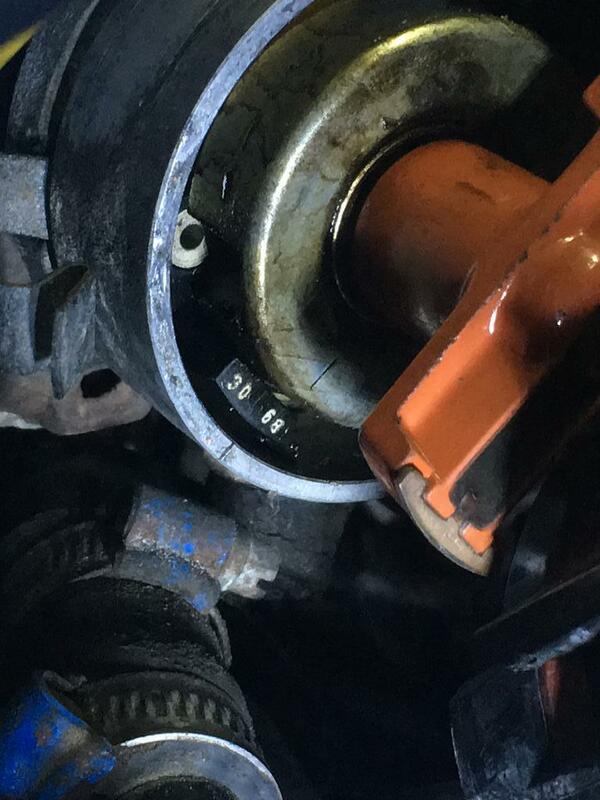 Removed the starter and found this. 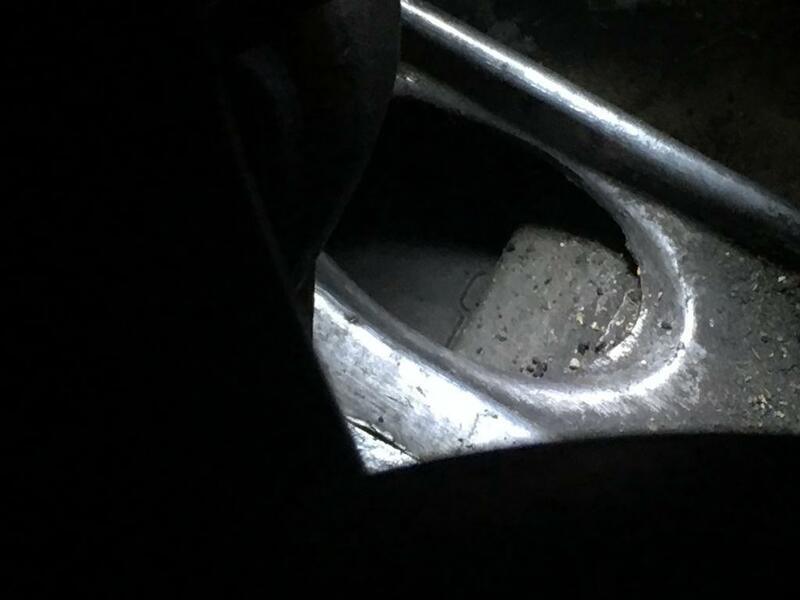 Went searching for what causes a starter’s nose cone to crack and found this article. I’m thinking it’s what they describe as engine kickback. Thoughts? That is crazy! While initially tuning my engine, I had plenty of kick backs, and long cranking cycles. I have never seen that happen! wow, that is something! Never seen that before. Everything I have read about engine kickback sounds like what I am experiencing. Basically, ignition is happening a touch too soon...causing the engine to rotate in the wrong direction. 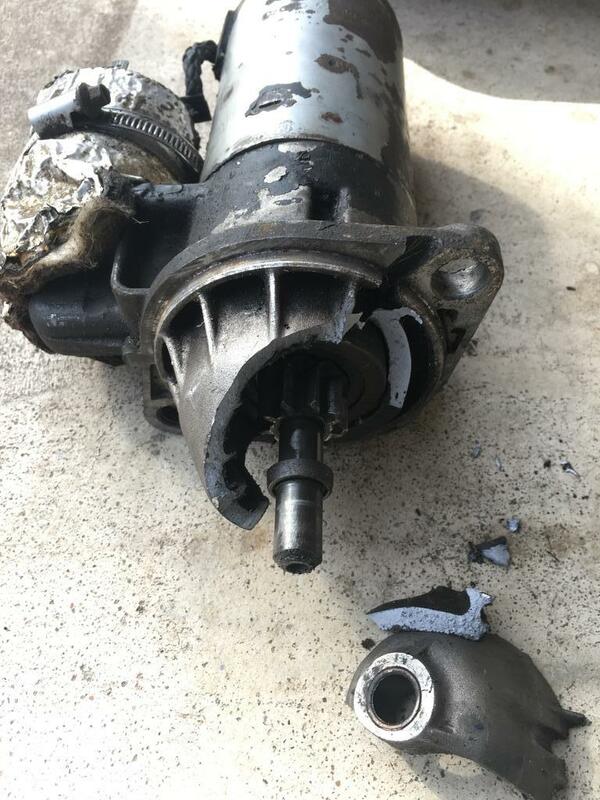 It's violent, as evident by the damage to the starter. Has anyone else experienced this? Can it be resolved by slightly adjusting the distributor position? I know the ECU controls the timing, but can you retard it just so that it delays the spark signal just a bit? Or are there other ways to fix it? I've got a replacement starter and don't want to break it too. yes distributor adjustment should be able to take care of that, sounds like maybe firing order is off? I would be surprised if the distributor was that far out of whack. Haenszel wrote: yes distributor adjustment should be able to take care of that, sounds like maybe firing order is off? I would be surprised if the distributor was that far out of whack. Thanks. I was hoping it would be possible. I paid close attention to the wire order when I removed the old distributor. The wire order was correct before and after the distributor swap. 1-2-4-5-3 starting from the timing mark and moving clockwise. If I'm wrong on that, please let me know. The distributor was spot on with the marks, but the hall sensor connector was loose and it failed this light test from the workshop manual. Adjusted the distributor alignment and installed a replacement starter and she runs! Yay! Very glad to see you got this figured out! Well. It’s only run that one time. Since then, it just struggles to start. I bought a noid light to test the signal at the injectors. Here’s a quick video. It looks like the signal to the injector stops after a few cranks. Any ideas on why? Last edited by jbrentd on Mon Feb 11, 2019 1:51 pm, edited 2 times in total. Just a shot in the dark, maybe FP relay? Or one of the sensors that feeds the ECU with an RPM or timing signal? From memory, the ECU won't trigger the FP until it hits an RPM threshold, maybe there's a weak signal or interference and it cuts out? FWIW, I'm following along with great interest. Almost exactly three years ago I went to Ikea to buy a new kitchen for my rental property and my 80q sedan wouldn't start... haven't driven it since. Mostly due to priority changes but slightly due to lack of gumption. Been chasing a non-start issue ever since, so your diagnosis pathway is very useful. Changed the POS, dizzy rotor & cap, plug wires, ignition switch, fuses and battery then checked/verified timing, all with no luck... then finally replaced the FP relay and got it to start up once. Never fired up again. I really REALLY want to drive that sucker with the 7A again before ripping into it for an AAN swap (after I build up some shop space). PRY4SNO wrote: Just a shot in the dark, maybe FP relay? Or one of the sensors that feeds the ECU with an RPM or timing signal? From memory, the ECU won't trigger the FP until it hits an RPM threshold, maybe there's a weak signal or interference and it cuts out? I too was thinking maybe the ignition timing or engine speed sensor. I wish I had an oscilloscope to truly test their signals. I need to read up on how to test the FP relay. I didn’t have much time or daylight tonight after I got home, but I was able to test and verify the function of both the fuel pump and the relay. I tested the pump by swapping the FP relay with one of the “215” AC relays and turning the ignition on. I could hear it running and could hear flow through the lines. I tested the FP relay by removing fuses 13 and 28 and checking for voltage after first turning the ignition on and while cranking. I assume ~11 volts is sufficient while cranking? - recheck the resistance across the timing and rpm sensors. IIRC, they were in the mid to upper 800 ohm range when I checked them before. Spec is 1000 ohm +/-. - inspect and clean the timing pin and the teeth of the FW. - inspect the face of the timing and rpm sensors. I’m wondering if one of them could have picked up small pieces of metal from when the starter nose cone broke. Last edited by jbrentd on Wed Feb 13, 2019 8:55 am, edited 1 time in total. jbrentd wrote: I didn’t have much time or daylight tonight after I got home, but I was able to test and verify the function of both the fuel pump and the relay. Good tip about swapping those fuses and relays. Nice to know exactly which ones to target. IIRC the FP relay trick people use supplies 12.5v all the time, so 11v should be sufficient.